'Rahul Gandhi is giving a shock to the English elite that is dominant in all structures. He himself comes from that background, but when he talks he says things that subvert that same English eliteness,' says social historian Professor Badri Narayan. With a new party promising new hope; the oldest party battling severe anti-incumbency, and a strident Opposition hoping to wrest power on the back of its prime ministerial candidate, India is up for an unprecedented election season ahead. Professor Badri Narayan, a social historian, anthropologist and thinker at the Govind Ballabh Pant Social Science Institute in Allahabad, says the Aam Aadmi Party has to develop an ideology and is a transitional hub of the common man. "They can say that their ideology is the ideology of the Aam Aadmi -- everyday life issues -- sabzi, chawal, bijli -- but people need more than that," he tells Rediff.com's Archana Masih. Analysing the politics and personalities of Narendra Modi and Rahul Gandhi, he says Modi has created a charismatic image but not hope -- and why Rahul Gandhi remains the only hope for the Congress. What effect is the Aam Aaadmi Party going to have in Indian politics? Do you see it as a trigger that can change the political discourse to focus on issues that affect people most -- like corruption, price rise? The Aam Aadmi Party is a metropole phenomenon. The AAP can support itself as an alternative to mainstream politics like the Congress and BJP, but only in the metros and the area around the metros like Haryana, Ghaziabad. It is very difficult to say how much success they will get in other cities. There are regional parties in cities that provide an alternative -- in Kolkata there is Mamata Banerjee and the Communist Party. In Mumbai, there is the Shiv Sena, MNS -- so it is very difficult to say that they will have a big impact in the 2014 election in the form of electoral success. But, of course, they have created a new space for new politics, a new forum for politics which is different from both the Congress and BJP. They are coming as an alternative, but it is very difficult to say that it will work in other metros. The AAP can't work in smaller cities. They are creating a new space and talking about corruption, price rise -- issues that affect the common man. Can they change the discourse and content of politics? The issues that they talk about -- corruption, price rise -- are transitional issues. This is not a long term issue, such issues can change. If the Lok Pal comes and action against corrupt people is taken frequently, then this corruption issue will get marginalised. Though I feel corruption will be an eternal issue of Indian politics and society. It is not going to die, but may not be (experienced) the way it is experienced nowadays. But as far as mehengai (price rise) goes, today it is there, tomorrow it might be less -- this is not an ideology and this is the problem of the Aam Aadmi Party. The AAP has no ideology. They have to develop an ideology. They can say that their ideology is the ideology of the Aam Aadmi -- everyday life issues -- sabzi, chawal, bijli (vegetables, grain, electricity) but people also need more than that. These are transitional issues. Like in the Dalit movement, the roti issue was once very important for them. Now it is not so, now they say dignity is more important -- roti toh hum kama ke kha letey hai (we manage to earn to feed ourselves) but dignity is a bigger issue for us. Similarly, the aam aadmi that is struggling today for bijli, paani, roti and mehengai in the metros may need another kind of ideological space tomorrow. And for that they can move to other parties. The AAP is not a permanent hub of the aam aadmi, it is the transitional hub -- and that too for the aam aadmi of the metropole, not of the town or village. 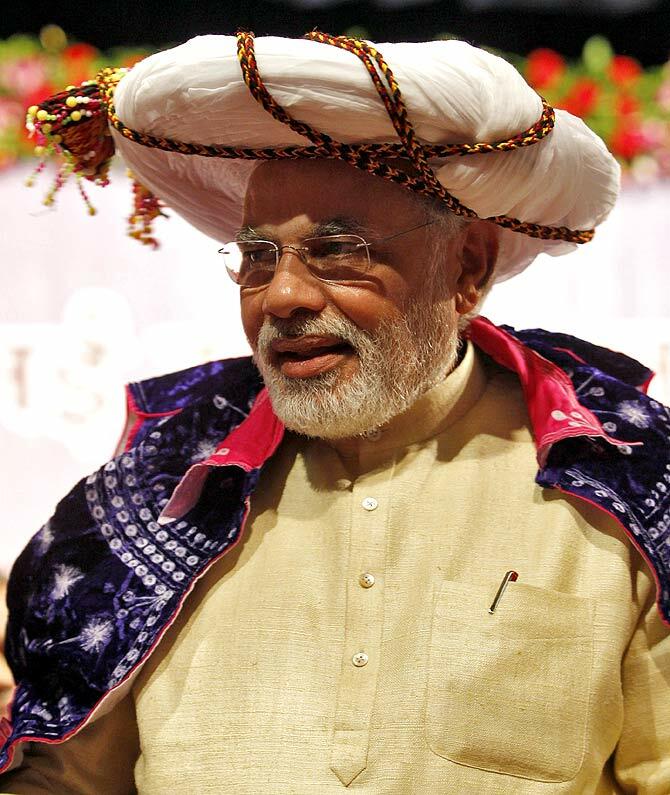 Image: The BJP's prime ministerial candidate Narendra Modi. Rahul Gandhi said there are lessons political parties can learn from the AAP, what are some of those lessons? The AAP started its politics from the gali, chowraha, mohallas and with issues that can directly connect with the people. What happened is that the Congress and BJP are not addressing these kinds of issues. When Rahul Gandhi talks about learnings from the AAP he is talking about these kind of learnings and also about fighting elections on small money, selecting common people as candidates etc. He himself talks about these things in the Congress not only today after the success of the AAP, but even earlier. He has been saying these things since the last 10 years from the time he came into politics, but the Congress is a very strange party. It does not want to implement this. Rahul wants to change the Congress, but the party is not changing itself. Being the second most powerful leader in the Congress if Rahul is unable to bring change, what hope is there for change in an old party like the Congress? A drastic change in the Congress is very difficult. If you want to flush out the dirty water, you have to first fill clean water and slowly the dirty water will flow out. This is his strategy and this will take time. But the Congress is a very difficult party to change. It does not have that kind of a structure. Its leaders are beyond the structure. They don't have a cadre base like the Communist party or other parties. You can change the secretaries (in other parties) and it touches the whole system of the party. Here if you change the state president, it is not going to affect the party because the party is in one way real and in one way virtual. This is a very interesting character of the Congress. And Rahul Gandhi tries to understand that and that is why he is trying to build a cadre. He talks about the poor, their struggle, that common people should enter politics -- he has been doing this even before the AAP. The Congress is an old structure which will take time to change. Old systems have their own problems. What does the Congress need to do in the run-up to election as it battles anti- incumbency and a strident Opposition, especially after the assembly election results? The basic thing they need to do is acquire visibility among the people. They come only in time of the election. They should learn from the Aam Aadmi Party. Everyday you have to raise issues, fight for people's issues and that the Congress is not able to do. It has to become visible at the grass-root. It has to raise people issues through dharna, pradarshan etc. They always show up at the time of election and want that everything will be in their favour, especially in the Hindi region. Image: Rahul Gandhi at the Confederation of Indian Industry, New Delhi. 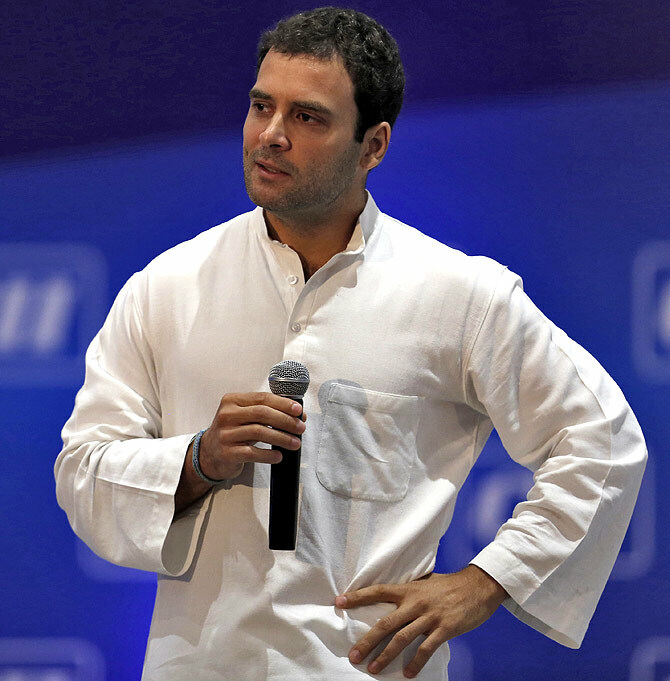 Do you think the Congress will nominate Rahul Gandhi as its prime ministerial candidate? Maybe. Maybe not. Rahul Gandhi is the only option for the Congress. Would you say that in Narendra Modi after a long time there has been a campaigner/candidate that is rallying the Indian public? Do you think he makes people feel that he can bring change? I don't know. He has created a charismatic image, but not hope. People don't want hope. They see him as a strong leader. The media is appreciating him, projecting him. He is giving good speeches. Modi is the product of the invisibility of Manmohan Singh. The Congress prime minister is invisible. He is not a speaker. People want to listen to someone who is decisive and strong. Modi has created that image and in that the social media, English media, have made this image and they are allergic to Rahul Gandhi. Most of the visual and electronic media is allergic to Rahul Gandhi because he is giving a shock to the English elite that is dominant in all structures. He himself comes from that background, but when he talks he says things that subvert that same English eliteness. He does not want to go the media, he does not want to interact with journalists, he does not plan his image-making through the media. Narendra Modi plans his image in this space through the electronic media -- through Twitter, Facebook. While Rahul Gandhi believes direct contact with the people will help him. But now society is more virtual than real. In his case, the virtual is not supporting the real and his real is not being developed by his own party -- so both are not working for him. Is Modi's appeal mainly within the middle classes and in the social media? I think so, but the BJP/RSS are very smooth mobilisers. Slowly, they are pushing Modi into villages. ,p>People don't know Modi, but they can see Modi speaking through the BJP, RSS -- so slowly, slowly he is entering the villages also. 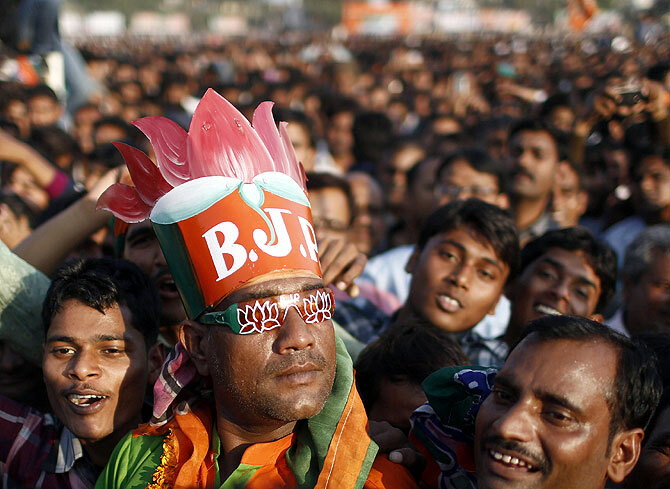 Image: Supporters attend a Narendra Modi rally in Agra. Columnist Aakar Patel recently said in a TV debate that Modi says the things people want to hear while people, especially the young, find Rahul Gandhi boring. Modi begins his speech by saying itni badi rally humne pehle kabhi nahi dekhi hai (Never before have I seen such a large gathering of people at a rally). Rahul Gandhi has a problem. He does not speak in people's parlance. He talks like the leader of a state agency -- he propagates what they are doing like the Right to Food etc. You need to connect with various kinds of languages. He is not doing that, he is talking one language that is economic, or policy language while Modi is talking many kinds of languages. That is why he is interesting for them. How many Lok Sabha seats can the BJP wrest in the important state of UP? In UP there is a Modi impact, but not a Modi wave. From 10, the BJP might get 25, 30 seats. Do you think based on his personality and governance, Modi has overcome the stain of the Gujarat riots and has a good chance at becoming the prime minister of India? He is trying to do that, but it will continue to hound him. But because of the dominance of majoritarianism, the minority may be silent the way it is in Gujarat. In this election the minority will vote against Modi. Seeing the Rajasthan poll results where Ashok Gehlot was banking on social schemes, do you think that social and welfare schemes may not bring the votes that you expect any more? I agree with you. Actually, people want gifts in the form of money. They want mobile money that they can use in any way. Ashok Gehlot gave free medicines -- unlike what (Madhya Pradesh Chief Minister) Shivraj Singh Chouhan did in MP providing direct money into people's bank through the Ladli-Laxmi Yojana or other yojanas. Social welfare -- like the Right to Food will not work much because people want money and you have to give it to them in various ways. Won't direct cash transfers have an impact when it starts? Yes it will, but it has not been implemented yet. Many schemes that Shivraj Singh Chouhan is implementing are central schemes. They are getting benefits because they are implementing these government schemes well. 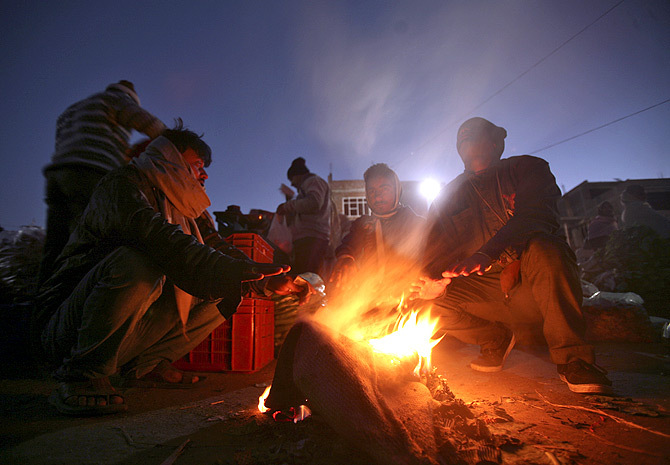 Image: People warm themselves around a fire at a vegetable wholesale market in Jammu. 12 ways the Congress can fight back!